ROYAL AND PRESIDENTIAL YACHTS - Wikipedia. 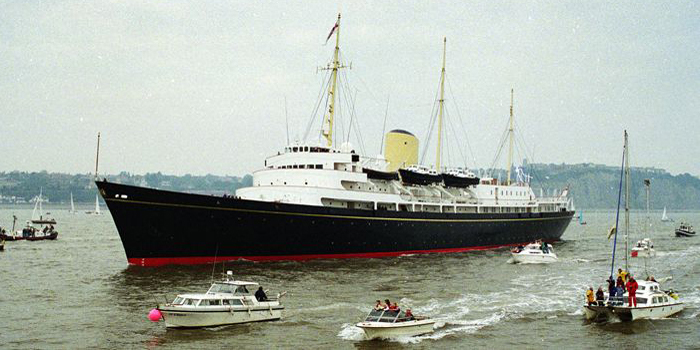 secret naval plans for a new £100million Royal Yacht Britannia replacement - The Telegraph. 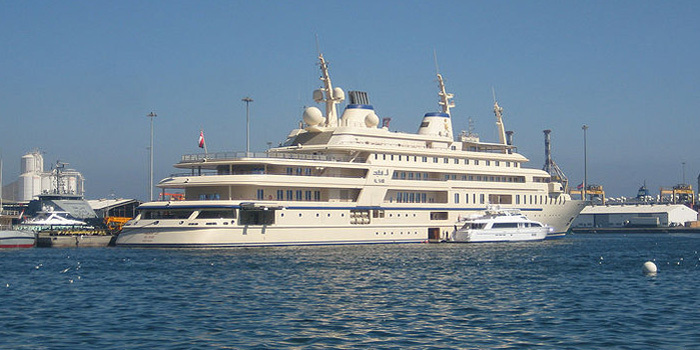 M/Y AL SAID - owned by the Sultan Qaboos of Oman. 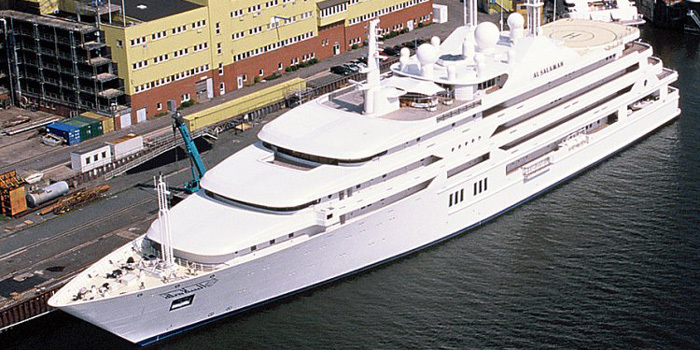 M/Y AL SALAMAH - the property of the Saudi Arabian defense minister, Prince Sultan bin Abdul Aziz. BRP Ang Pangulo - presidential yacht and was acquired by the Philippine government in 1959. 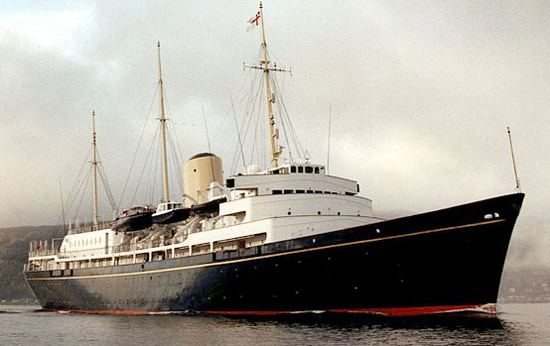 HMY BRITANNIA - the royal yacht of United Kingdom - decommissioned in 1997. HMY Britannia - Royal Cutter Yacht. Gaff-rigged cutter built in 1893 for Commodore Albert Edward, Prince of Wales. She served him and his son King George V with a long racing career. CLEOPATRA'S BARGE | Pride of Hawaii - the royal yacht (1820-1824) of King Kamehameha II of Hawaii. M/Y DANNEBROG - the royal yacht of Denmark. 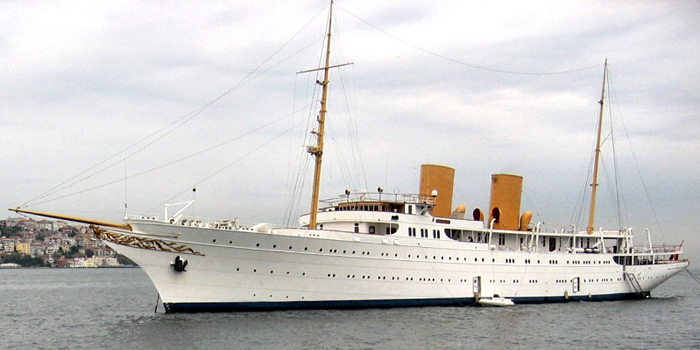 De Groene Draeck - royal yacht of Beatrix of the Netherlands. Derzhava - royal yacht of the House of Romanov (1871-1898). 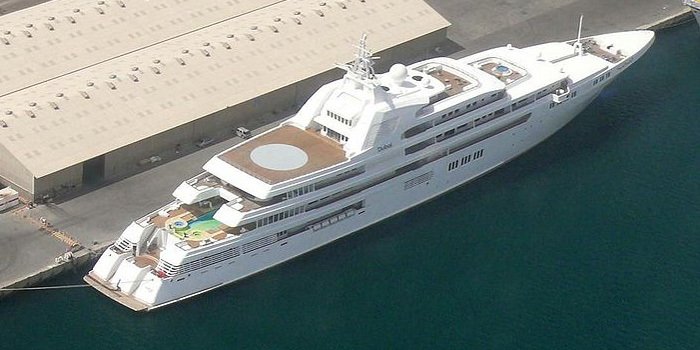 M/Y DUBAI - owned by Sheikh Mohammed bin Rashid Al Maktoum, the ruler of the Emirate of Dubai and the Prime Minister of the United Arab Emirates. EL HORRIA | Mahroussa - royal yacht built for Isma'il Pasha, the Khedive of Egypt in 1865. JRM GALEB - belonged to the late President of the Yugoslav Republic Marshal Tito on his numerous foreign trips and to entertain heads of state (1948-1980). HHS GLASGOW - royal yacht belonging to the Sultan of Zanzibar (1878-1896). M/Y GRACE | Deo Juvante II - the wedding gift from Aristotle Onassis to Prince Rainier and Princess Grace of Monaco (1956). M/S Heimdal - royal Norwegian yacht (1892-1905, 1905-1908). SMY HOHENZOLLERN II - used by the German Emperors between 1878 and 1918, named after their House of Hohenzollern. LIVADIA - imperial yacht of the House of Romanov (1873-1878). LIVADIA - imperial yacht of the House of Romanov built in 1879–1880 to replace the yacht of the same name that had sunk off the coast of Crimea in 1878. USS MAYFLOWER - served as U.S. presidential yacht until 1929. NAHLIN | Luceafarul | Libertatea - in 1936 Nahlin was chartered by King Edward VIII and used by him and Mrs. Wallis Simpson during their love affair. The yacht was bought in 1937 by King Carol of Romania for £120,000. K/S NORGE - the royal yacht of Norway. 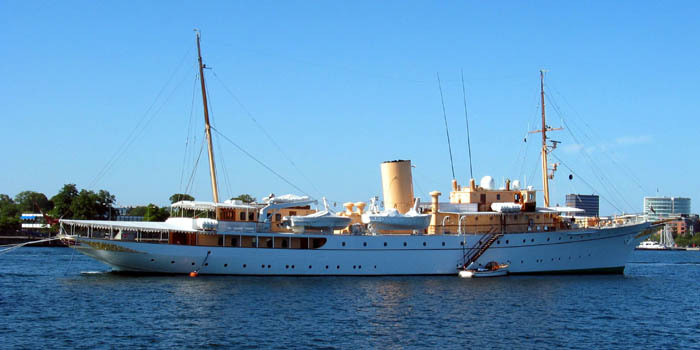 USS POTOMAC - Franklin Delano Roosevelt’s presidential yacht from 1936 until his death in 1945. 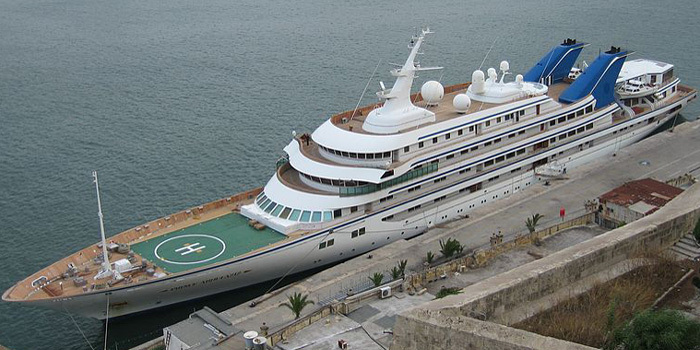 M/Y PRINCE ABDULAZIZ - one of the royal yachts of the Saudi royal family. SS RIVER QUEEN - closely associated with U.S. President Abraham Lincoln and Gen. Ulysses S. Grant. M/Y Savarona - luxury state yacht owned by the Republic of Turkey. 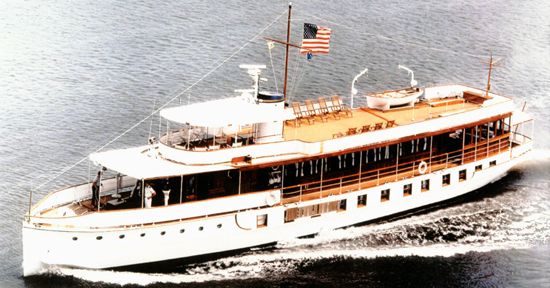 USS SEQUOIA - former United States presidential yacht used from Herbert Hoover to Jimmy Carter. STANDART - the Russian imperial yacht, serving Emperor Nicholas II and his family (1895-1918). Thistle - unsuccessful Scottish challenger of the seventh America's Cup in 1887 against American defender Volunteer. Thistle was sold to the German emperor Wilhelm II (who otherwise used the SMY Hohenzollern) in 1891 for 90,000 gold marks and renamed Meteor. HMY Victoria and Albert II - 360 foot steamer launched 1855 and royal yacht of the Sovereign of the United Kingdom until 1900. HMY Victoria and Albert III - royal yacht of the Royal Navy of the United Kingdom serving four sovereigns (1901-1939). USS WILLIAMSBURG - served as a U.S. presidential yacht from 1945 to 1953. 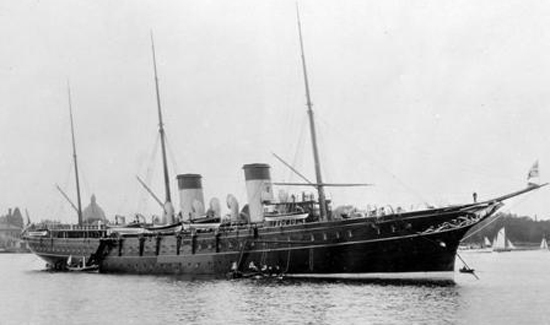 USS YACONA - during the period when she was called Amélia III, the 527 gross ton vessel was owned by D. Carlos, King of Portugal between 1889 and 1908.